Description: Evolution of the Tactical-Pistol Concept: With the M9A3 semiauto pistol, Beretta has created a coming-together of all the tactical and functional features that today’s combat professionals may require. From Vertec-style thin grip to universal slide design convertible from safety-decocker to decocker-only, from a beveled magazine well to oversize mag-release button, from a 3-slot built-in Picatinny rail to high-capacity capability for maximum firepower, the M9A3 was designed to deliver the performance that military, law-enforcement and VIP-protection professionals demand. In short, this combat pistol was designed to be perfect for any tactical use, including home- and personal defense, tactical competitions as well as duty carry in any condition. Vertec-Style Thin Grip for Instinctive Pointability: The Vertec-style vertical grip of the M9A3 offers two very important benefits. Its vertical configuration makes it easy to point the handgun to where one would normally point the index finger of the dominant hand. This instinctive pointing is highly prized by tactical shooters and makes for consistent--and consistently-accurate--target acquisition. Also, the grips are thin in spite of being able to accommodate a double-stack, high-capacity magazine. This makes trigger-reach simple even for those with smaller hands, besides offering a more compact profile for those carrying the M9A3 concealed. All this, plus the crisp checkering on the front- and backstrap as well as removable wraparound grip, make any combat hold simple and consistent. Versatility and easy Accessorization: One of the most salient benefits of the M9A3 is its universal slide, which is easily convertible from FS to G mode. This means that the M9A3s safety lever can be used in a safety-decocker mode or it can be converted to perform a decocker-only function for those who prefer this configuration. More versatility is also offered in the form of a removable front sight, for tactical shooters who have a distinct preference in terms of sight picture, material or construction. In addition, a variety of accessorization options is possible thanks to the built-in 3-slot Picatinny rail located in front of the trigger guard, which enables the easy attachment of a variety of tactical lights, laser devices and more. Easy to Use and Maintain: The M9A3 was designed to be used in the heat of combat. For this reason, Beretta has put a generous bevel at the magazine well, so that tactical magazine changes may be performed quickly and easily with one hand, regardless of lighting conditions. Along the same lines, the magazine-release button is oversized, making it simple to use when seconds count even while wearing gloves. 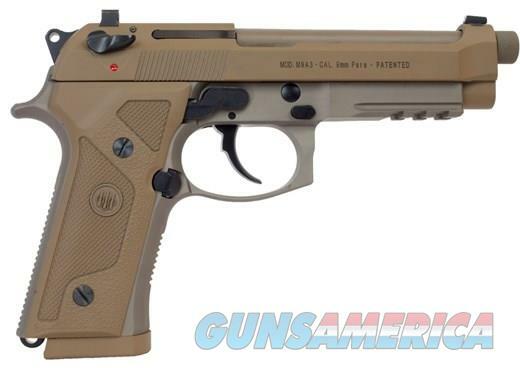 And the M9A3 is low-maintenance thanks to its hyper-resistant FDE finish that is practically impervious to the elements, sand-resistant magazines in 15 or 17 rounds (10-round standard), and intuitive tool-free disassembly. Whether it’s on duty, at home, for concealed carry or at the range, the M9A3 will always give you the absolute best of Beretta’s centuries-old experience and long history serving the needs of professionals the world over. We can special order for you! Just ask. We will compete with advertised prices to the best of our capability. Our goal is to provide you the best pricing and service possible. Please allow five business days for check/MO clearance. We accept credit card payments over the phone for a 2% fee. Contact us to pay. Know your state and local laws before buying. We only ship to an FFL. LAYAWAY TERMS: 60 days same as cash with 20% down. No refunds on layaway, no transfers to other firearms and any balance unpaid after the scheduled date results in forfeiture. Thanks for looking.